Well, this is unexpected, HP has just announced that CEO Mark Hurd is stepping down. CFO Cathie Lesjak has been appointed as interim CEO. According to a press release, Hurd, 53, is resigning on the heels of sexual harassment charges by a former HP contractor. The company’s investigation concluded that there was no sexual harassment violation, however it did find that Hurd violated HP’s “Standards of Business Conduct.” On a conference call, HP’s General Counsel, Mike Holston elaborated further, explaining that the case centered around expense reports that were used to hide the true nature of Hurd’s close relationship with the contractor. “Mark demonstrated a profound lack of judgment that seriously undermined his credibility and damaged his effectiveness in leading HP – and Mark agreed,” Holston said in a statement. According to the details available, it seems like Hurd, who is married (at least for now), was entangled in a personal relationship with a hired contractor— an affair he tried to obfuscate with some fudged expense reports. In a somewhat dejected tone, Hurd said stepping down was a “painful decision” and vaguely acknowledged that he displayed a lack of character. In the wake of Hurd’s abrupt departure, HP is on the hunt for a new CEO. The board of directors has already cobbled together a search committee, led by Marc Andreessen, Lawrence Babbio, Jr., John Hammergren and Joel Hyatt, to find a proper replacement. In a word, HP’s official press release (see below) was awkward. It was a jumble of half-disclosures and odd statements that raised more questions than answers. Meanwhile, intertwined among comments on ethics are adamant assertions of HP’s financial health. Investors can take comfort in the fact that HP is raising its full-year outlook for revenues, but I’m sure the vast majority are appropriately wondering, “What exactly is going on here and what will happen next?” The stock fell several points in after hours trading. Holston’s comments certainly shed important light on the circumstances, but investors are no doubt feeling a little unsettled with the CEO search still in progress. Thus, amid controversy and a whirl of questions, Mark Hurd abruptly wraps up his five year tenure at HP, a highly profitable time for the company. Over the last five years, the stock price has more than doubled with Hurd at the helm, aggressively pursuing profits. For his part Hurd has been paid handsomely. Last year, for instance, Hurd pulled in $24.2 million, which was actually a step down from 2008, when he made a whopping $42.5 million. 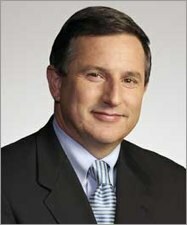 PALO ALTO, Calif.–(BUSINESS WIRE)–HP (NYSE: HPQ) today announced that Chairman, Chief Executive Officer and President Mark Hurd has decided with the Board of Directors to resign his positions effective immediately. The Board has appointed CFO Cathie Lesjak, 51, as CEO on an interim basis. Lesjak is a 24-year veteran of the company who has served as HP’s CFO and as a member of the company’s Executive Council since January 2007. She oversees all company financial matters and will retain her CFO responsibilities during the interim period. Hurd’s decision was made following an investigation by outside legal counsel and the General Counsel’s Office, overseen by the Board, of the facts and circumstances surrounding a claim of sexual harassment against Hurd and HP by a former contractor to HP. The investigation determined there was no violation of HP’s sexual harassment policy, but did find violations of HP’s Standards of Business Conduct. A Search Committee of the Board of Directors has been created, consisting of Marc L. Andreessen, Lawrence T. Babbio, Jr., John H. Hammergren, and Joel Z. Hyatt, which will oversee the process for the identification and selection of a new CEO and Board Chair. HP’s lead independent director, Robert Ryan, will continue in that position. Lesjak has taken herself out of consideration as the permanent CEO but will serve as interim CEO until the selection process is complete. Candidates from both inside and outside the company will be considered. The selection of a new chairman will occur in conjunction with the CEO decision. The company does not expect to make any additional structural changes or executive leadership changes in the near future. HP is announcing preliminary results for the third fiscal quarter 2010, with revenue of approximately $30.7 billion up 11% compared with the prior-year period. In the third quarter, preliminary GAAP diluted earnings per share (EPS) were approximately $0.75 and non-GAAP diluted EPS were approximately $1.08. GAAP and non-GAAP EPS were negatively impacted by $0.02 pertaining to one-time charges relating to the previously announced U.S. Department of Justice settlement. Non-GAAP diluted EPS estimates exclude after-tax costs of approximately $0.33 per share, related primarily to restructuring, amortization of purchased intangible assets and acquisition-related charges. For the fourth fiscal quarter of 2010, HP estimates revenue of approximately $32.5 billion to $32.7 billion, GAAP diluted EPS in the range of $1.03 to $1.05 and non-GAAP diluted EPS in the range of $1.25 to $1.27. Non-GAAP diluted EPS estimates exclude after-tax costs of approximately $0.22 per share, related primarily to restructuring, amortization of purchased intangible assets and acquisition-related charges. For the full year, HP now expects revenue in the range of $125.3 billion to $125.5 billion. FY10 GAAP diluted EPS is expected to be in the range of $3.62 to $3.64 and non-GAAP diluted EPS in the ranged of $4.49 to $4.51. FY10 non-GAAP diluted EPS estimates exclude after-tax costs of approximately $0.87 per share, related primarily to restructuring, amortization of purchased intangibles and acquisition-related charges. HP plans to release its final results for the third fiscal quarter on Thursday, Aug. 19, 2010, with a conference call at 6 p.m. ET/3 p.m. PT to provide additional details.